It’s time to check in. When’s the last time you checked in? No, not at a hotel. When’s the last time you checked in with your own goals, plans, and aspirations for the future? In Checking In, Stephen J. Cloobeck—entrepreneur, investor, philanthropist, and the founder and former CEO and chairman of Diamond Resorts International—invites you to check in with yourself to take stock of where you are, where you want to go, and, most importantly, how to actually get there. Drawing from the hotel, accommodation, and travel worlds in which he built his success, Cloobeck shares one-of-a-kind business experiences and life lessons, demonstrating how a radical customer service mindset—what he calls the Meaning of Yes—can substantively change both personal and professional outcomes. Make no mistake—this is straight-talk from one of the best. 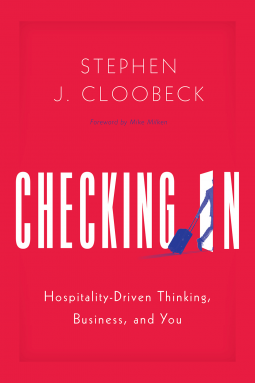 Cloobeck may be known for being tough, opinionated, and unabashedly competitive, but he’s also developed a philosophy of hospitality-driven thinking relevant to anyone looking to find success on their terms. Part strategy directive, part leadership coaching, part memoir, Checking In will change how you approach people, problems, and possibilities. ​Written for everyone who wants more out of life, Checking In calls you to view the world through the lens of hospitality-driven thinking, to make the most out of opportunities others miss, to take well-placed bets on yourself, and to say “yes” to the right risks at the right time. These are the practical business insights and all-too-real anecdotes you didn’t know you needed from a source you’d never expect. Stephen Cloobeck's book covers the life of a modern-day business genius. I've known him for decades, and he has never changed. He is cocky, self-assured, aggressive, arrogant, self-confident, and always focused. He's not afraid to confront anyone (including me) when it feels appropriate. But when all the brashness passes, and it does quickly, one sees a person with a social conscience, a person who is known for his generosity. Stephen Cloobeck is a good person, a creative of thousands of jobs, an innovator, and to many, a friend. Stephen J. Cloobeck is the best in the business. He told me so himself. Stephen Cloobeck's story shows that anything is possible when good leaders don't just fight but strategically collaborate for deserving causes. It merits being told, studied, and hopefully replicated. Whether you're a business leader or an emerging entrepreneur, there's a lot of wisdom from Stephen Cloobeck about how to be successful. I've learned invaluable business lessons from Stephen--most importantly, his unwavering belief in the Meaning of Yes. He created a groundbreaking and innovative 24/7 service culture that always places guests first. People across the globe are changed by these core values every day.